F. C. M. Q. Mariano,C. A. Paixão,R. R. Lima,R. R. Alvarenga,P. B. Rodrigues and G. A. J. Nascimento (2013). Several researchers have developed prediction equations to estimate the metabolisable energy (ME) of energetic and protein concentrate feedstuffs used in diets for broilers. The ME is estimated by considering CP, ether extract, ash and fibre contents. 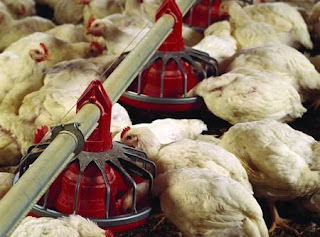 However, the results obtained using traditional regression analysis methods have been inconsistent and new techniques can be used to obtain better estimate of the feedstuffs’ energy value. The objective of this paper was to implement a multilayer perceptron network to estimate the nitrogen-corrected metabolisable energy (AMEn) values of the energetic and protein concentrate feeds, generally used by the poultry feed industry. The concentrate feeds were from plant origin. The dataset contains 568 experimental results, all from Brazil. This dataset was separated into two parts: one part with 454 data, which was used to train, and the other one with 114 data, which was used to evaluate the accuracy of each implemented network. The accuracy of the models was evaluated on the basis of their values of mean squared error, R 2, mean absolute deviation, mean absolute percentage error and bias. The 7-5-3-1 model presented the highest accuracy of prediction. It was developed an Excel® AMEn calculator by using the best model, which provides a rapid and efficient way to predict the AMEn values of concentrate feedstuffs for broilers. The software FANN TOOL 1.2 (http://code.google.com/p/fanntool/) was used to implement the networks.